Various types and sizes can be supplied and fitted to suit the hydraulic circuit of each application. Client motors (supplied free-issue) can also be fitted. Aluminium oil radiators of high strength are combined with the latest integral fan/motor units. The resulting coolers have a small face area ideal for modern compact production machinery. 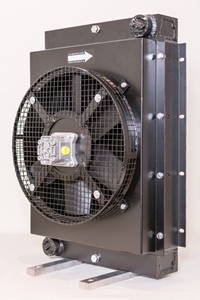 The small size and light weight make these coolers ideal for vehicle applications. High ratings (not available elsewhere) are possible with DC motors. The noise values are given by the fan manufacturers in dBa and apply to 'free field' conditions. In practice different conditions lead to sound reflection reverberation and resonance, dependent on insulation details. The resulting actual noise levels can be in excess of the nominal figure shown.